John Okoro is the creator of Auspicious Agile and he has founded Agile services practices for Rally Software in Asia and for a US management consultancy. With nearly a decade using Agile methods, John is an expert at using Agile practices and methods at Enterprise scale and in large and distributed organisations. John is a frequent speaker at Agile and industry conferences and an InfoQ contributor on DevOps. Savita Pahuja has expertise in Scrum, Lean, kanbanareas and other visual discovery methods. She started her journey in IT industry as a developer and contributed the organization in agile adoption. Then she moved into agile world as a consultant and trainer. Since then she has been working with different clients for agile adoption and giving trainings on scrum and kanban. Hugo Messer has been building and managing teams around the world for over 10 years. His passion is to enable people that are spread across cultures, geography and time zones to cooperate. He's the owner of Bridge Global, a global software powerhouse and ekipa.co, the education platform for distributed teams. Distributed teams are the norm for many organizations today. Companies are global, communications technologies allow people to live away from the "office" location, and many new workers are nomads. Even though most people will acknowledge the wisdom that collocated work is easier, reality is often different. Companies distribute their offices and partners globally and people who run projects need to find ways to collaborate remotely. With the advent of new technology, this movement will only grow. Teams need to form a certain team spirit or team culture. Why are they a team? What values are important to them? What are they working on? Separation among team members influences team spirit. If members are separated by distance, they have fewer chances for live meetings. Time differences make it a challenge to meet online. Cultural differences influence the way they collaborate, often resulting in miscommunication and misalignment. Different teams may be working on different products in a product portfolio or together on one product. The more distributed the teams, the stronger the need for strong governance. Underlying the products is architecture. Roles like product owner, portfolio manager, and ScrumMaster are assigned based on a delicate balance of skill, knowledge, and location. Organizations need to decide where to form what roles in order to achieve company goals. Our backgrounds are in IT. The IT industry is at the forefront of exploring how to work in distributed teams. Over the past decade, people have found that the Agile Manifesto helps in developing better software. Agile also helps people communicate and collaborate better. 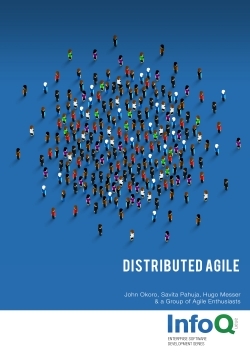 Although the manifesto holds that “face-to-face communication is better” (which implies collocation), there are many reasons agile works well in distributed teams too. In this book, we assume that you already know the basics of agile. If not, it will help you to read some other books or blogs about agile. We also assume you (will) face challenges in distributed work and are looking for solutions. Our book provides solutions that are framework agnostic, meaning we don’t favor Scrum or LESS or SAFe or kanban over another framework. We believe the power of agile is in shaping a different culture, mindset, and way of working. That’s the basis for making distributed teams work better. Having said that, some of the practices shared by people in the field (described later) may be biased towards a certain framework.